The first thing Brian H. noticed was that he could grow a real beard. It had been years since that had been possible, years he spent bedeviled by hair loss on his head, face, arms and legs. Brian, 34, who asked that his last name be withheld to protect his privacy, suffers from alopecia areata, an autoimmune disease afflicting about 1 percent of men and women, causing hair to fall out, often all over the body. He believes that the “mangy patches” of baldness that have plagued him since his 20s have cost him jobs and relationships. After trying various treatments, Brian enrolled this year in a study at Columbia University Medical Center testing whether a drug approved for a bone marrow disorder could help people with alopecia. One of the study’s leaders, Angela Christiano, is a dermatology professor and geneticist who herself has alopecia areata. After successfully testing on mice two drugs from a new class of medicines called JAK inhibitors, which suppress immune system activity by blocking certain enzymes, the researchers began testing one of the drugs, ruxolitinib, on seven women and five men. Some of their findings were published Sunday in the journal Nature Medicine. The results for Brian and several other participants have been significant. “Pretty quickly, there were sort of fringes,” Brian said. Then “three or four large areas started to show hair growth,” and by five months, he had plenty of hair on his head, arms, and even his back. “I was blown away,” he said. The disease differs from other types of hair loss, including male pattern baldness, and there is no evidence the drug will work for those conditions. Experts caution that even for alopecia areata, it is too early to know if the treatment will work for most patients and if there are significant side effects or safety concerns. The study is continuing, but so far a few participants did not regrow hair, said Dr. Julian Mackay-Wiggan, director of Columbia’s dermatology clinical research unit and an author of the study. Dr. Luis Garza, a dermatologist at Johns Hopkins Hospital who was not involved in the research, said the results were encouraging enough that he would consider prescribing ruxolitinib to patients who could not be treated with other methods and who understood potential side effects. 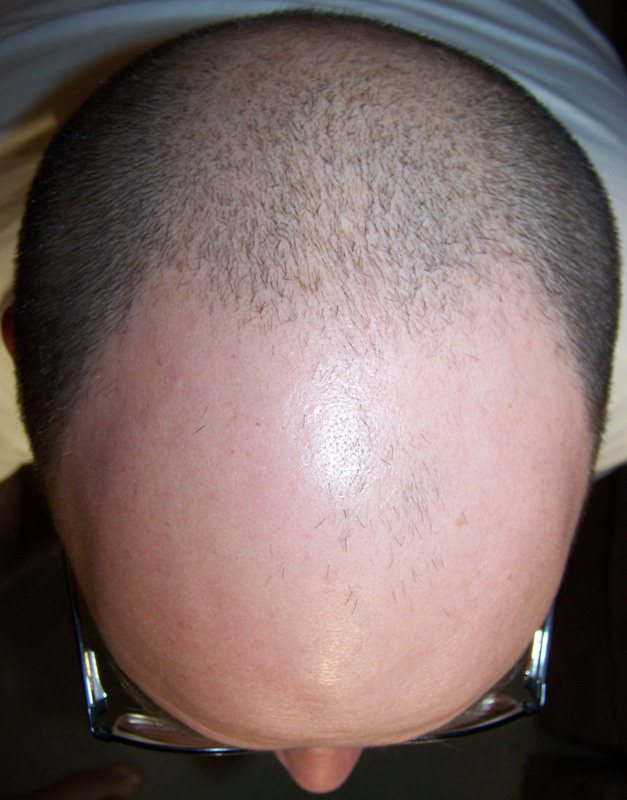 Cortisone injections often work for patients with isolated patches of baldness, but they must be done regularly and are painful. For patients with severe baldness, “it’s impossible to inject their whole scalp,” he said. But Dr. George Cotsarelis, a dermatologist at the University of Pennsylvania, urged caution until further research is conducted. He said it makes sense that drugs suppressing immune system activity would work for a disorder caused by an overly active immune reaction. But because patients in the study received twice-daily pills that circulated ruxolitinib throughout their bodies, rather than topical cream, he said they were “treated systemically with a very toxic drug” that can cause liver and blood problems, infections and other ailments. Although the patients have experienced few side effects, the study is small and not a randomized trial comparing ruxolitinib to other treatments. Dr. Raphael Clynes, a co-leader of the research while he was a Columbia professor (he now works for Bristol-Myers Squibb), said the team tested cream and pills on mice, and planned to test a cream on people. The team also plans to test on people another JAK inhibitor, tofacitinib, which is approved for rheumatoid arthritis and grew hair on mice. In June, Dr. Brett King, a dermatologist at Yale, reported that tofacitinib caused full hair growth and no negative effects for a man with alopecia universalis, a variant involving almost total hair loss. The idea to use JAK inhibitors grew out of a genome analysis Dr. Christiano conducted, which found that in alopecia areata, hair follicles emit a signal that draws immune cells to attack. Her team identified specific cells involved and found genetic similarities to unrelated autoimmune diseases, like rheumatoid arthritis. For Brian, five months on the drug yielded a full head of hair. For unknown reasons, the new hair is white instead of black, its original color. Still, “It’s a lot easier to shrug that off than to pass the silent judgment of people” who he said he felt were staring at his bald splotches. He said side effects, including slight anemia, were minor.